Your mum, Your garter, Your way! Since the 1970’s the Texas tradition of wearing Homecoming Mums has grown in popularity in mind-boggling proportions. This tradition started-out as giving a simple fresh white flower corsage with few steamers. Today they are statements of individuality and considered by some a "rite of passage". Homecoming Mums are most popular with high school students, but they are for EVERYONE! 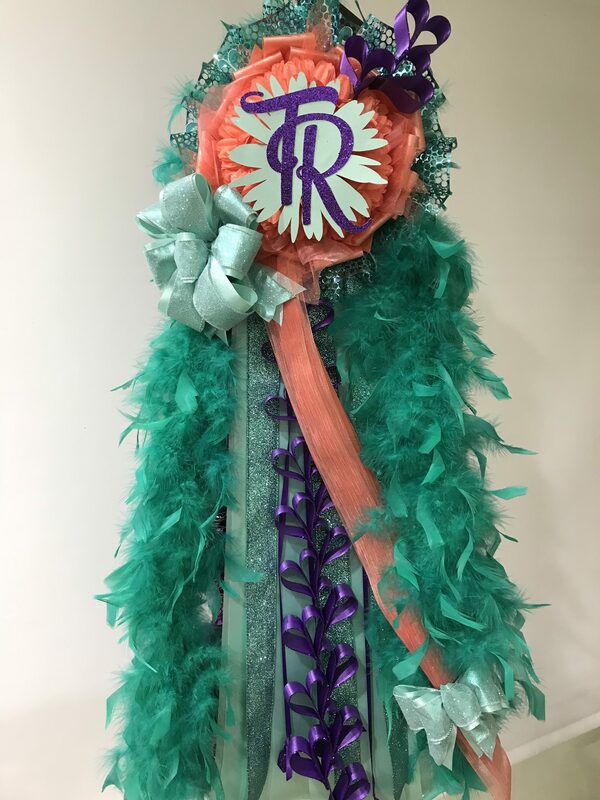 The annual Homecoming event is celebrated by teachers, coaches, administrative staff, parents, grandparents, siblings, best friends, alumni, ETC... Homecoming Mums and Garters represent much more than just school spirit, they are an expression of your individuality, and are to be worn with glowing self-pride. What a wonderful tradition to have! When selecting a designer to create your Homecoming Mum or Garter, you will want to review a designers experience, craftsmanship, and professional design. Each designer has a unique style, kind of like a finger print. This unique style is reflected in each arrangement that the designer makes. Select a designer that creates arrangements that appeal to your individual style and taste. Being born and raised in Texas, I grew up with the uniquely wonderful Homecoming tradition! At the early age of 13, I developed a passion for floral design and took my first class at 15. In 2006 I started Smitherman Crafts, selling Homecoming Mums and Garters in and around Lago Vista, Texas. In 2018 I launched this new website with new the business branding of Twistin’ Ribbon. Thank you for visiting my site. I am very excited to share this lifetime dream with you.